Current limitations in our shopping cart software require a price of greater than $0 for each item. In reality, your credit card will not be charged $0.01 for samples. If your order consists entirely of free samples, credit card information will not be collected. Samples are a small cutout from a production rug. See product details below for more information. Relax color samples are representative of the colors for the Relax family of rugs only. Luxury custom sized bath rug. Very plush high pile rug 30mm / 1.18in. Made from long wearing and durable polyacrylic which has a soft wool like feel. This densely woven rug is produced using a mingled thread colors giving this design depth and dimension. For example the Atlantic Blue has two blue color threads which gives the Atlantic Blue Relax rug a deep rich look. Designed and produced by well-known German brand Kleine Wolke, established in 1968. Custom rugs are backed by their quality guarantee for a period of 5 years (though we often find people happily treasure theirs for longer than that). Custom sizes are cut based upon a cutting chart. We are happy to work with you on special size and shape requests (info about terms/how to draw and calculate pricing for irregular shapes). Custom rectangular rugs: WIDTHS from 7.9 to 59.1 inches, almost 5ft. LENGTHS from 23.6 to 118.1 inches, almost 10ft. Custom round rugs: Diameter cuttings from 27.6 to 59.1 inches. Custom cuttings will arrive to you within 3 to 5 weeks of your confirmed order. Custom cuttings are final sale items. Sample OPTIONS: 2 FREE color samples OR 4 FREE half samples. Samples are sent free via First Class mail to any destination in the U.S. The samples represent the color, backing, edging and pile height/density of an actual production rug. To ORDER SAMPLES you can place an order directly through this page or email us at support@vitafutura.com and provide your mailing address and color selections. Champagne: Beautiful light beige tone. The Relax design is a mingled thread rug so there are two color threads for each color option giving it depth and added beauty. One color in the Champagne is a very light beige tone and the second color thread is a a medium tone beige. Walnut: Soft medium tone brown. A true soft brown tone. Rust: Rusty orange. Perfect to add a earthy tone punch of color to your bathroom. Old Rose: Dusty pink rose is the best way to describe this color. Ruby Red: Deep dark true red tone. Golden Yellow: The golden yellow tone of this rug will brighten up any space. Turquoise: This blue green turquoise rug is just beautful. 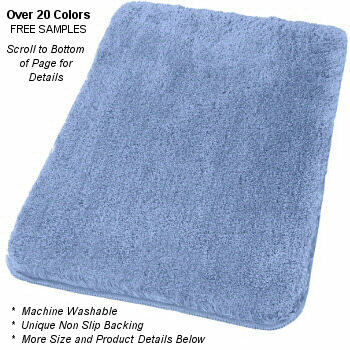 Atlantic Blue: Deep rich blue tone bathroom rug. Eggplant: Deep bold earthy eggplant purple tone. Magenta: Deep beautiful rich dark pink / purple. Bast: A very interesting color. A very, very light taupe. Ecru: Beautiful brownish grey color.